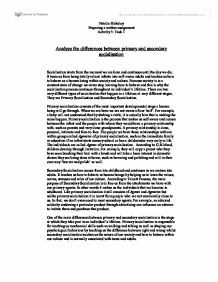 Analyse the differences between primary and secondary socialisation Socialisation starts from the moment we are born and continues until the day we die. It turns us from being totally reliant infants into self-aware adults and teaches us how to behave as a human being within society and culture. Because society is in a constant state of change we never stop learning how to behave and this is why the socialisation process continues throughout an individual's lifetime. There are two very different types of socialisation that happen in a lifetime at very different stages. They are Primary Socialisation and Secondary Socialisation. Primary socialisation consists of the most important developmental stage a human being will go through. When we are born we are not aware of our 'self'. For example, a baby will not understand that by shaking a rattle, it is actually him that is making the noise happen. Primary socialisation is the process that makes us self-aware and occurs between the infant and the people with whom they would have a primary relationship with, such as parents and very close grandparents. ...read more. In other words it makes us the individuals that we become in adulthood. Like primary socialisation it still consists of Agents and Agencies but unlike primary socialisation it is learnt from people who are not emotionally close to us. In fact, we don't even need to meet secondary agents. For example, an admired celebrity endorsing a particular product through advertising can influence an admirer to imitate them and purchase that product. One of the main differences between primary and secondary socialisation is the stage at which they take part in an individual's lifetime. Primary socialisation is responsible for teaching us mechanical skills such as walking and talking as well as shaping our psychological behaviour by teaching us the difference between right and wrong whilst secondary socialisation teaches us the nature of our society and how to behave within our culture and is normally associated with teens and adults. The relationships an individual has between agents of primary and secondary socialisation is also very different. ...read more. 1976). This points to the fact that as primary agents, parents have an ideology of how children should be raised within their society and culture. In turn, the child will grow up with the same ideal view of how children should be raised dependant on their gender. By the time we reach an age where secondary socialisation can influence us we already know what gender we are and how we should behave. However, agencies of secondary socialisation such as peer groups are still responsible for reinforcing gender roles. 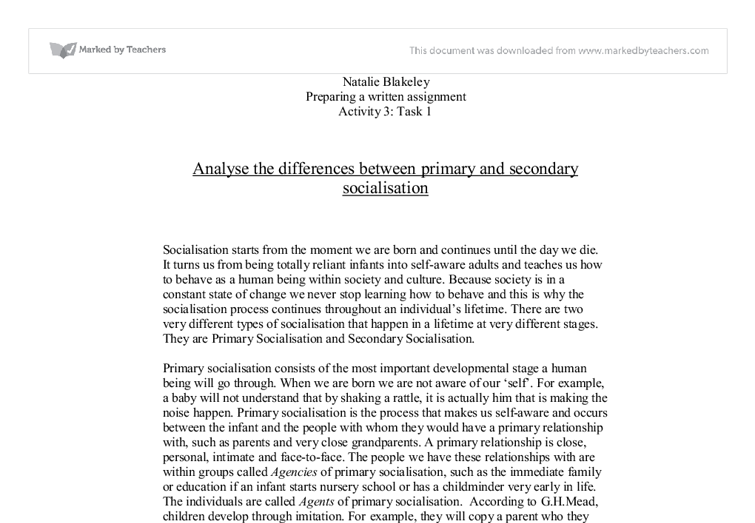 In summary, we have looked at certain key points about primary and secondary socialisation such as when they occur and what they teach us and it is reasonable to conclude that there are some vast differences between the two. Although they follow the same structure in that they both have socialising agents and agencies, there is a vast difference between what these agents and agencies teach us and what their purpose is. However, they are both vitally important when it comes to making an individual who they become in later life. ...read more. It was not the norm a mother and daughter to be seen out like that. It also became a norm that when there were adult visitors in the house, my brother and I would make ourselves scarce and would rarely talk unless spoken to. I will create a table, which I can use as a tally chart. Down the left hand column, I will mention different types of disruptive behaviour. Subsequently, I will create two more columns, one for males and the other females.